Many people remember coming to live in Billericay at Foxcroft, a beautiful building at 100 High Street. “The moment I came to Foxcroft and met the children, I knew I would be happy in Billericay,” recalled Betty Raines. Betty answered an advertisement to work at the Children’s Home at 100 High Street, known as Foxcroft. In 1955, the building looked a little different from that of today – no Virginia Creeper – just neat box hedges and a couple of rose bushes. Foxcroft is still a beautiful house, built around 1740. It was first used as a private home and then from 1860 it was the Billericay Grammar School for about three years. Prior to this the Reverend Darby lived here, bringing up his large family and ministering at St Mary Magdalen on Sundays. 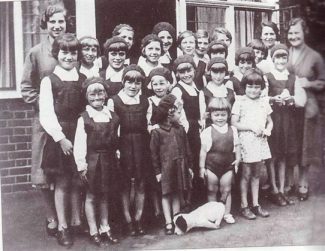 In 1932 Essex County Council purchased the building for use as a children’s home and it was here that Betty Raines looked after the children who came to live there. During the early 1970s, another children’s home was built at Patricia Gardens at South Green near Billericay. Betty moved from Foxcroft after 20 years’ service. She eventually retired from working with children to working with older people at the Billericay Day Centre and certainly made a lot of friends there, too. Numerous people from around the world remember their time at Foxcroft (and Betty)with warm affection. Editors Note: Do you recognize anyone in the photos and do you have any recollections of Foxcroft or the home in Patricia Gardens? We would love to hear from you. I lived in Foxcroft from about 1949 till around 1955. There are 6 children I remember: Terry Hunt, Paul and Gerald Millard, Pauly Johnson, Carol Chitock , Wendy Cumbers, sisters Sylvia and Marjorie Edwards, Mrs. Stathem, Aunty Betty, and the sewing ladies, Mrs. Coggins and Mrs. Coggersal; Miss Nissem was in charge. Every morning she would call out, “cup of tea” and someone would make it and bring it to her. She smoked Churchmans cigarettes. If you wet the bed you had to go into the bathroom and wash your sheets before you had breakfast. On our way to the primary school, which was just past archer memorial hall, was a huge green gas holder which we believed to be a German bomb and we would run like hell. The school had outside toilets and we had a bottle of milk at our desk. If you were naughty you had to stand outside by the coke heap and a local bobby would walk up and tell you off, then chat up the young ladies working there. During the school holidays we would ambush the dustman with home made bows and arrows as they walked up to pick up the bins” whoa”. The gardener was Mr. Hollaway, who had a limp and two daughters. We would go to the local picture house and whatever type of film we saw was our weeks play theme. My pocket money was 1 shilling and 3 pence, given on a Saturday morning. We had a huge garden with a swing set and a small pond. I loved it at Foxcroft. I was then sent to the Royal Wanstead school which I hated. But I will always remember the good times at Foxcroft. And also, the Americans that came to see us during Christmas with presents. I am now 74 and live in Florida. It would be lovely to hear from any of the old gang. My Dad, William Holland (Billy), was in Foxcroft, he’s 72 now, and has many happy memories of being there before passing his eleven plus and moving to Royal Wanstead where he was not so happy. I would love to see some photos if there are any? I had a friend Suzanne Goldberg who lived at Foxcroft and went to the Billericay School and attended my class. This would have been in the 1950/60s. The last time I met her she said she had failed her exams through nerves, although to me she was a very bright girl. Unfortunately we lost touch – there were no mobile phones or social media in those days! I recall how we enjoyed playing in the gardens of Foxcroft and have really fond memories, especially on Guy Faulks with the fireworks. I would love to meet her again to share how both our lives have turned out. I also recall Auntie Betty! I believe I was in one of the two homes in the early 1960’s but not sure when and how long for. I would love to know how to access the records so I can fill in the gaps. I didn’t live in Foxcroft, I lived at 5 Fairview on the out road to Southend, near the Lockers. I did have friends at Foxcroft though, Fennick and his younger brother Joseph Hunnam. Spent some time after school and at weekends with them at Foxcroft and I remember the Aunties Betty and Jan.
Something that sticks in my mind was: – You could get through to Chapel Street from the rear of the property’s large garden and woodland so many a time we went through to the road to watch the traffic. On this particular time we saw a car hit a pigeon so, we picked it up took it back to the house, put it in a box with grass, fed and watered it to keep it alive. After a couple of days the Pigeon recovered and was ready to go so, we took it to the bottom of the rear garden, I lifted it from the box and (as seen done on TV) threw it into the air. Unfortunately I must have thrown it too hard as it dropped to the ground with its neck snapped. It’s surprising what sticks in your mind. Ronnie Bush, Deborah Hicks and Lynne Riches please get in touch. Email editor@billericayhistory.org.uk stating that they may pass on your details to me. It’s Andy Smith, the youngest Smith brother in Foxcroft. My brothers, John, Peter, Paul and Joe in that order are all still with us. I also remember Donna, Denise and Deborah. Alternatively find me on Facebook – Andrew Smith, Morcambe, Lancs. I Lived at Foxcroft in the 50s I must of been the black girl with short curly hair. I was the only black girl there at the time. I ended up being fostered by a Mr & Mrs Gladden. I was cruely treated there for a few years & eventually was transferred to another home in Chelmsford essex. My name then was Susan Smith. My home was at Foxcroft in the early 70’s. I also remember the Smith bothers, I was a close friend of Andy. Good memories, some not so good, but there were far worse places, as I was soon to learn. I will let them all know! Does anyone remember my nan Valerie Wallis and Edgar (Eddie) Wallis who attended Hillcrest Lodge, Walton on Naze 1970s onwards. I was in Foxcroft in the 1970s and I remember the Smith Brothers very well. Paul was about my age and Andrew and Joseph were younger. Auntie Rose and Uncle Bert Wood were there when I went and were wonderful people. There were also three sisters, Debbie, Donna and Denise – I remember Donna being off school one day and we had a delivery of meat from the butchers. The sausages came in a long string and auntie Rose and Uncle Bert used them as a skipping rope for Donna to skip!! Would not be allowed now but it was fun in those days. I now live in Milton Keynes. I was in Foxcroft with my two brothers, Kenny & Jeffrey Berner, from about 1960 to 1966. If anyone remembers us please get in touch. Me and my twin sister was at 12 Patricia Gardens between the mid to late 70’s and remember Aunt Betty very well, she was a lovely lady. Our surname was Taylor at the time. My mum Shirley Reeves was in Foxcroft in 1944, she still as a letter from Miss Nisome. I have taken mum back there and have been trying to get her in there to look at her room. I ain’t giving up hope they find it in their heart to let her as she is 78 now and has cancer. She always talks about her time spent in there. Hiya Colin anytime email me naylor_26948@Hotmail.co.uk James n myself still haven’t had that trip to Tendring, will do soon though. Sorry for late reply but I checked site before and missed your reply. I cannot e-mail you as I don’t have address (hidden). I was 5 years old in summer 1953 so I think we would have been in the same class at school. People remember different things but some time a reminder brings this out. Lady teacher, school milk warmed up by the heater in the winter. She would tell stories using a home made box scrolling pictures across with a light behind. The shop near the church had a penny wriggles chewing gum machine outside and if the arrow was pointing towards you then you got two for a penny. There was a black smith forge opposite the church. I think I went to Tendring in 1953 and remember American airmen coming one Xmas with bags of toys. Also an Xmas Party on an American ship in Hawich harbour. I also remember a huge Easer egg in a waste paper basket, I think was sent by Woolworths, as I saw one on display in the shop. Remember Gumption cleaning cream and Gibbs tooth cleaning blocks in a tin, blocks of white soap for washing and red (carbolic) for floors. It was against the Children’s Act to split up children but no one cared about that. Moth balls. Sorry again with late answer. Having lived in Billericay from 1932 on and off until 1973 I am always interested in stories of the place. Hiya Colin, wow you remember more than me. James and I will have a drive down to the area soon, I’m in Rayleigh now. There were only 2 black children in the home; I had some contact with the boy now a successful man with 2 lovely daughters. I went there in 1953 aged 5, James was already there with my other older brother. I got fostered out at 7ish in Chelmsford but I didn’t settle as I missed my brothers. At nearly 9 I went home to my Mum and Dad and gradually my brothers came home too for weekends as James went to Foxcroft after I was fostered. I wish there were photos from those days. James knew a Carol Chitock at Foxcroft, maybe her brother was Bobby? I remember the back garden, the swing and running around trying to chase James and his friends and he remembers some things. He is a year older so he would have been 6. Anyway we all survived and had a good life. I have a beautiful family plus have been married for 49 years to the same man!!! Ha ha lucky man… anytime just mail me Colin. Hi Maureen, you are the first person I have found from Tendring homes, I am not very good with names but I remember a Bobby Chitup & Mrs Buckles a local white haired lady that helped out in the girls house. One of the aunties was called Doris Howard, could have been later. There was me, my twin sister Gillian and my elder brother called John who got fostered not long after, then my sister got fostered. There was chicken near the girls home and I got burnt from a bomb fire on my neck when another child stuck a burning stick on my neck. The head master at the school was Mr Barns and his wife. There was a swing in the back garden a three wheel bike and a scooter, I only remember a black girl with small black curly hair which we seemed to think was funny. I was there until it closed in about 1955 and was sent to Coopersale near Epping, fostered for a year in Clacton then went to Hillcrest lodge in Walton on the Naze where I met Aunty Doris again. Funny thing was the dinning tables, toy lockers and beds came from Tending, perhaps the piano as well. We could have been in the same house as I started off in the girls house as I was to under school age. The only boy a think. Remember the thick cream on the milk in those days. If you slept in a room (Oaks) with a small boy it could have been me. Oaks/Chestnuts was the home with the biggest garden. I remember a picnic in the garden on Coronation Day. Nice to hear from you. I don’t remember James as a name but I do rember things that we might have done together like climbing up the drain pipes. Just seen that you were in the next door home, perhaps we met at school. Had a mate from Foxcroft called Alan Gunn. Often wondered what happened to him! I was in Foxcroft with my two sisters in 1968 for three to four years I believe. Would like to hear from anyone there at the time. It was mainly boys. Hi Colin yes I remember Oaks ‘n’ Chestnuts. James, one of my brothers, remembers being in there, think I was too. Johnny was in the other one, older boys. Do you remember 2 black children same age as us, Stuart Tippett and Wendy Lowe. I can’t remember you Colin, you’re the same age as me, 67 nearly, lovely to hear from you tho’. Do you remember James? He was only year older than me. I hope life turned out good for you and all the kids that were in there. Sorry Colin I was in Firs ‘n’ Limes. Maureen, I was at Tendring children’s home in the 50s. I think there was two pairs of homes there and I seem to have been in the other one next door, I think called Oaks and Chestnuts. This home closed mid 50s I am now 67. Jim thank you for your email saying Betty Wollard wanted to get in touch. We have recently met up and spent a lovely couple of hours remenising about our time in Foxcroft. I was there from Jan/Feb 1956-June 1957. We have agreed to meet again probably in the new year. I’m very sorry for no replies till now. I did laugh when I read Gillians write up re my brother Alan Naylor; yes he was the pincher!! And yes Alan did get knocked down, I remember he always tore around, he was badly hurt too. James would have been there till 1959/60, Alan was 6 years younger than James so he stayed for few more years. He was split by all the Aunties, Miss Nissan was in charge. If anyone wants to contact please do. Hello, Can anyone please let me know if they were in Foxcroft with my father and uncle in 1958-59. Their names are Albert and Peter Piper and they would have been aged about 11 years and 8 years old. please let me know if you know them. Yes fond memories indeed. See my sister Lesley has left a message a while back as well. Betty I’m sorry I don’t remember you but I have been sent your email address and will drop you a line. I remember Mary don’t know her last name but we were good friends. I remember two brothers one being Alan and I thought the other was Walter. Alan was forever crossing the road when he shouldn’t have and did end up getting knocked down. Whether this was the Naylor brothers I’m not sure. I was there from Jan/Feb 1956-June 1959. I did say I would write about my experience of being in Foxcroft but it brought back a lot of memories that I haven’t been able to do it yet. However I have been thinking about it lately and will try and do it. I think I am one of those people whose minds shut down to prevent bad things being remembered. Fond memories, I remember you Sue Hayward, would be good to get in touch. Fond memorys of Foxcroft. I was there in the mid 70s and was treated well. Seem to recall using the term “aunty” but not sure if it was Betty. I went out to work there so must have been around 17yrs old. It was mixed girls and boys while I was there. I was at Foxcroft circa 1952/3, the matron was a Miss Noisome but I also remember Auntie Betty. Paul Millard is a name I remember as a boy who had to stay elsewhere as he became too old for the home. We had to move to Moulsham near Chelmsford for about a year while I assume Foxcroft was modernised. I remember with great fondness the holidays in Clacton and a lame gardner who played with us in the gardens at the rear. Reading about Alan Naylor, I do remember that name. I am sure one of them pinched a lot when he was excited and screwed up his face. I loved my time at Foxcroft, I was 5 years old, but was fostered out to live in South Green for 6yrs. I only have happy memories of them years.! 1958 till 1964. Auntie Betty, and Auntie Shan, I saw her last at my foster aunts funeral. She was pleased to see me, married with a daughter. Auntie Betty knew my two brothers, they lived in South Green home, Fenick and Joseph Hunnam. Me and my sister Christine were fostered out and Robert and Diane were in a nursery in Chelmsford. I loved my time at Foxcroft. I took my sister to Foxcroft today and told her about it as she can not remember her time there. I loved Foxcroft with Auntie Shan, Betty and all the aunties there. We were a family split up hear there and every where, but I love my memories of Foxcroft and the garden. We were four from our family of six that stayed at Foxcroft, Fenwick, Joseph, Chris and me, Gillian. You write about Aunty Betty (Raines) but what about Jan Storm, she worked at Foxcroft too. I seem to remember she was from Holland, and drove a Morris 1000, and it was green. She had a funny thing about changing her shoes in the car for a pair of slippers. She also moved down to South Green, I was the only one, out of the four sisters, that went to 12 Patricia Gardens . My sister’s were Elaine, Frances, Hilary and me Madeline, I am in the photo at the top of the page second row up, two from the right, the one with the fringe. I’m keen to know when they closed Foxcroft. I did return to see the building a couple of years ago, and was saddened to see what had been done to the interior. But that’s progress. I was even more surprised to see the lovely big garden that was, is now a huge car park for a super market. As children we had lots of fun in the garden. There was also an underground shelter we used when the siren went. Incidentally, we were all girls during my time there. I loved being there and I just wish that I could contact the two friends I’ve already mentioned. I was at Foxcroft Billericay, leaving there in 1944. I knew a Miss Jones, a senior/or head and a Miss Kellick a cleaner etc. I could be the Danny Teresa Tubudy mentioned, if you read this Teressa please get in touch it would be great to chat about our time there. In response to Maureen: I knew Alan Naylor. We both went to Billericay Primary School in the early sixties. He invited me to tea once at Foxcroft. That’s about all I remember except that I owe Alan an apology for something. He has probably forgotten all about it and maybe me too but it is something that has bugged me for some years now. I’ve search for information on the children’s home but with no luck until now I’m hoping you can help me I was in the home when I was about 2 years and 6 months old I want to know everything about me while I was there and I do mean everything as I remembering being at the top of the outside stairs and the door opening and I was knocked down the stairs BUT I don’t remember anything until they brought me back to the home with 1 of my legs in plaster cast and they put me in the sickroom looking outside and a robin was sitting on the wall in the snow Please if anyone can tell me about my time in the home please let me know as I suffer with a really bad back and that fall could have been the start of my problems many thanks for having this site about Foxcroft may you Have Very Happy New Yearxx oh and if Betty Raines is still with us please tell her Thankyou for being there for all the children and me and my siblings. A photo from my days at Foxcroft. I lived at foxcroft in 1953/4. I was the only coloured girl there at the time. My name then was susan smith. Ii eventually got fostered by an english family who ended up being very cruel to me. 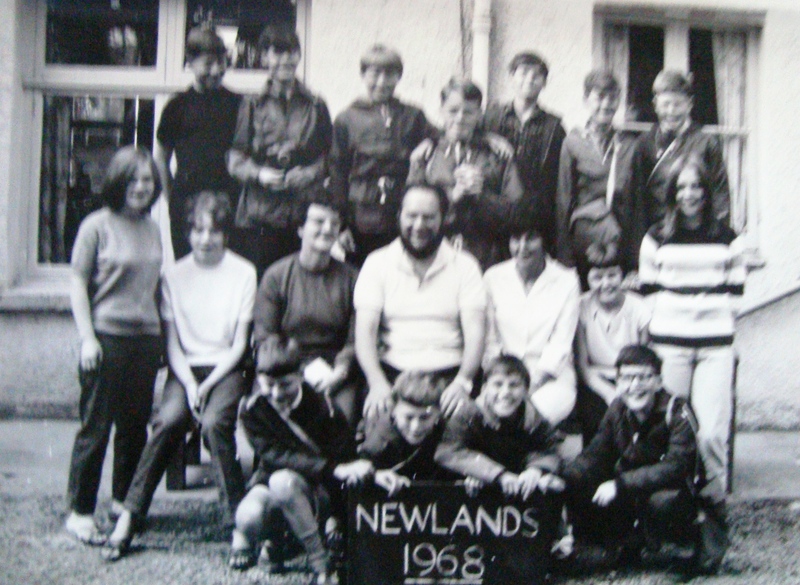 Then i was moved to another childrens home in Chelmsford, Essex. Life has carried on since then and now at 67 I am very happy. I was at foxcroft in the 1950’s. Hi 2 of my brothers James and Alan Naylor were at Foxcroft for some years in the 50s I had many visits to see them from home I was also in care at the Limes and Firs in Tendring James is now 66 Alan is 60 both doing well im 64 now I shall always have fond memories of Auntie Betty on my visits to Foxcroft there was an Auntie Shan too seemed a bit stricter anyone remember James and Alan?? 2 of my brothers were in Foxcroft when Auntie Betty was there and Auntie Shan Alan and James Naylor. Would have been 1950s early 60s. I attended Great Burstead primary school and a boy from Foxcroft was in my class and we were quite good friends his name was Paul Millard, I wonder what happened to him, he would be about 70yrs now. As a writer researching Billericay history, I have been interested in the children’s home and its move to South Green. Last week I interviewed Betty Raines for her memories of the time she helped to run the home all those years ago. Will try to post the article I wrote about it for the Billericay Weekly News a couple of years ago. Have some nice photos, which I will also post on the site soon. Sue! My father and 5 brothers where in Foxcroft too! This was in the 1960s, Joseph Smith? John Smith? Peter Paul Andrew. I have been trying for years to find info on anyone who went there or the home itself with no joy! I wonder if you can help me? What a great idea. I have just posted a reply/comment to the shopping trip article. I was in the Foxcroft Children’s home in the mid to late 1950’s. So pleased to be able to read some ones memories.